If you require a dental bridge contact Westgate Dental Centre to arrange an appointment. A dental bridge is used to fill up a gap created by a missing tooth or teeth. Also known as a fixed dental prosthesis or fixed bridge, it replaces a missing tooth (or teeth), extending across the area lacking teeth. A bridge is typically held in place by your own teeth or artificial teeth (known as abutment teeth) on either side of the missing teeth area. This arrangement makes a bridge fixed and permanent. A dental bridge, like any dental implant, restores your smile, fixing the gap between your teeth. Importantly, it doesn’t get to distort the shape of your face in the process. With your teeth restored using a dental bridge, a patient is able to chew and speak properly and without discomfort; and these teeth are held in place – prevented from drifting off position. When it comes to dental bridges there are quite a few different types from which you can choose depending on the condition of your gum and teeth and the location of your missing tooth (or teeth). Traditional Bridges: A traditional bridge is typically used in situations where healthy natural teeth is available on either side of the missing tooth. Before the bridge is fixed, the teeth on both sides (abutment teeth) will be prepared by way of filing. Maryland Bridges: Also known as resin-bonded bridges, these bridges are used when the missing teeth can be found at the front of the mouth. Here artificial teeth is fused to the back of your mouth using a porcelain or metal framework that bonds your existing teeth with a metal or porcelain wing. Cantilever Bridges: Much like a traditional bridge, cantilever bridges are used when there is only one adjacent teeth to the missing tooth (teeth) – on one side – with the other side completely empty. This procedure anchors the crown over that one available natural teeth. Implant Bridges: In a procedure that is quite similar to Maryland bridges, an implant bridge is used when there are no healthy teeth to support a bridge. In this case, the individual will first receive dental implants which will anchor the incoming bridge. A dental bridge is a straightforward process if you have a healthy abutment of teeth on each side of the missing tooth. Your dentist will first file down the two healthy teeth in preparation for the bridge – to allow for the placement of a crown over them. If you do not have healthy enough teeth or do not have enough teeth to serve as support for a bridge, the dentist surgically places implants with roots into your jawbone for that purpose. Your dentist then takes impressions (molds) of your teeth from which the crowns for the abutment teeth and the bridge will be modeled. 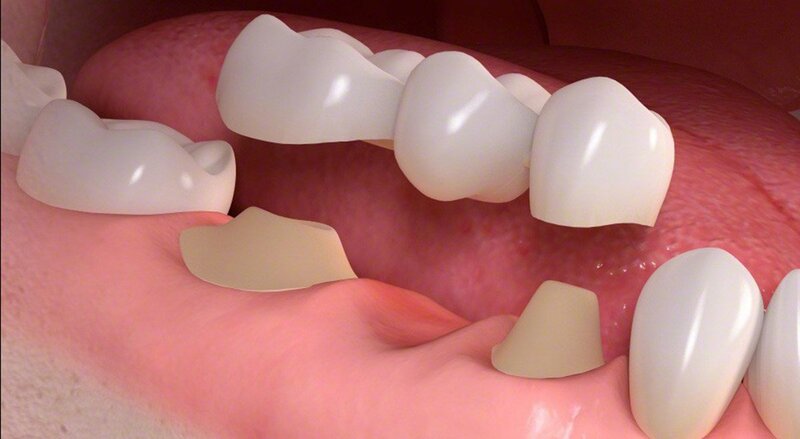 In the meantime, a temporary bridge is placed in your mouth to keep the exposed teeth and gums protected. The dentist removes this temporary bridge on your next visit, replacing it with the custom-made bridge. The bridge will be placed, tested for fitness, and adjusted as necessary. Your dentist will have to determine how best to place this teeth (and if cement will be needed) to ensure they do not come under undue pressure. Dental bridges are not the most expensive solution to your missing teeth problems, but they might still be considered costly by some. A dental bridge restores your ability to eat and speak properly. A typical dental bridge can last anywhere from 5 to 15 years, depending on how well cared for it is. You want to brush and floss your dental bridge daily, as you would your natural teeth to prevent gum diseases or decay. Be sure to speak with your dentist on the best care procedure for your new teeth.